Copyright 2011, Yuening Zhang and Roger Beckman. Used with permission. An e-book usage survey was sent through departmental mailing lists to the graduate students, scientists and faculty members of the Chemistry Department and Biology Department of Indiana University, Bloomington (IUB). Several faculty members, scientists and graduates students from the Chemistry Department and Biology Department were also contacted for interviews about their e-books usage experience. The purpose of the survey and interviews was to get a better understanding of users' e-book awareness, what advantages they find in using e-books, what concerns they have about e-book purchases and features, and what the library could do to better promote the use of e-book resources on campus. The IUB libraries have access to Springer electronic books (e-books) published from 2005 to 2013, Wiley e-books from 2007 to 2010, Elsevier e-books from 2008 to 2012, and Royal Society of Chemistry (RSC) e-books from 1968 to 2011. In addition, e-books are available through several other platforms, such as NetLibrary, MyLibrary, and Books 24X7. Due to a number of factors including a decision to move to Serials Solutions to manage e-books, a large number of e-book titles were not indexed in IUCAT, the university library's online catalog, at the time of the study. Springer titles were best represented, although there was a gap that included the newest titles, approximately nine months, at the time of the study. The successful loading of MARC (MAchine-Readable Cataloging) records of Wiley, RSC, Elsevier, and recent Springer titles using Serials Solution began in January 2011, after this survey was completed. The current study surveyed and interviewed faculty members, scientists, and graduate students in the Chemistry Department and Biology Department of Indiana University, Bloomington (IUB). The purpose of the survey was to find out how well e-books are accepted in the above subjects for both research and teaching. What is the preferred format for e-books? 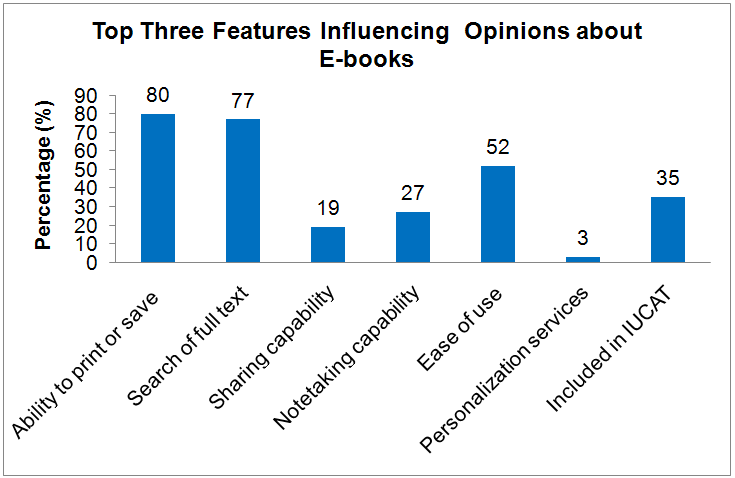 What factors prompted users to use and what factor hindered them from using e-books? What can the Chemistry Library and Life Science Library at IUB do to improve the accessibility of e-books? Based on the current research, how could the libraries react to and predict the future publishing trends and accommodate collection development practices into the users' needs? E-books appeared as a library resource in the 1990s (Dorner 2003), and is continuing to be an important topic for publishers, librarians, and users. A review of the literature indicated that there have been several studies on the usage and collection development of e-books in academic libraries. A large scale survey conducted by the University of Illinois library was recently reported (Shelburne 2009). The study was carried in collaboration with Springer and broke down the interviewees into faculty, graduate student, and undergraduate student. The survey results indicated that e-books have become "an important service offered" by the library. Another research conducted by librarians of the University of Idaho Library utilized usage statistics from three platforms: Ebrary, NetLibrary, and Books 24X7 (Sprague and Hunter 2009). Usage information was also categorized into 34 groups based on Library of Congress (LC) call numbers. The results showed relatively low use of e-books across both subjects based on LC call numbers and platforms. The Louisiana State University Library identified about 3,000 print/e-book equivalents in its catalog and collected use statistics every monthly for a year for both formats (Christianson and Aucoin 2005). Difference of format preference was discovered based on subject and LC classification. For example, patrons appeared to prefer print books for philosophy, while they prefer e-books for library science. The literature review also revealed some research on the disciplinary difference in the usage of e-books. A study conducted at the University of Wales in the United Kingdom utilized focus groups representing three disciplines: business and management, engineering, and health and medicine (Armstrong and Lonsdale 2005). 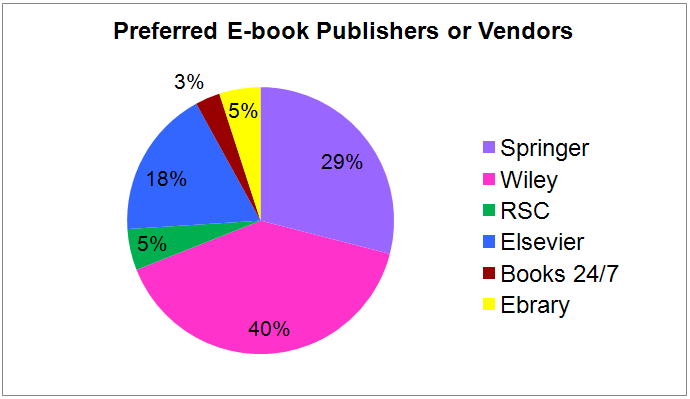 This research identified the types and levels of e-books required by different disciplines. For example, all disciplines agreed that undergraduate textbooks and reference books should account for the primary collection of e-books. In addition, engineering and health indicated monographs should be available electronically, while engineering also identified conference proceedings, standards, and research/professional reports should be available as e-books. In another study, the chemistry and mathematics librarian and the engineering librarian at the University of Oklahoma Libraries invited teaching faculty in the pure and applied sciences for interviews and surveys on e-book usage (Bierman, Ortega & Rupp-Serrano 2010). Their study analyzed the faculty members' awareness of the availability of e-books, their usage of e-books, and their opinions about the advantages and disadvantages of using e-books. Their results revealed that e-books had been accepted in the sciences. In addition, their qualitative study found that there was no significant difference between the ways faculty of the pure and applied sciences use e-books. In another article, librarians from the University of Oklahoma Libraries also conducted an online survey and personal interviews about e-book usage with faculty and graduate students from the School of Geology and Geophysics at Oklahoma University (Foote and Rupp-Serrano 2010). This study revealed unique features such as the issues of graphics and imaging of e-books for geosciences research and instruction that were desired and thus should be considered by e-book publishers. The IUB libraries are purchasing e-books and instructors are beginning to use e-textbooks. E-books are also changing the way that scientists access, read, share, and store books and articles. Our current research was built on previous literature and aims to study the impact of e-books in chemical and life science education and research and how they are being used by researchers and instructors of chemistry and the life sciences. The Chemistry Library and Life Science Library are two branch libraries on the IUB campus headed by the same subject librarian. The Chemistry Library serves undergraduate and graduate students, staff, and faculty members of the IUB Chemistry Department, as well as the entire Indiana University community. In 2010, there were 42 faculty members, 20 scientists, 60 post-doctoral fellows, 150 graduate students, and 300 undergraduate students (including biochemistry) in the department. The Life Science Library serves undergraduate students, graduate students, staff, and faculties of the IUB Biology Department, the Biochemistry Program, the Medical Sciences Program, and the Nursing Program. In the Biology Department in 2010, there were approximately 50 faculty members, 150 scientists, 50 post-doctoral fellows, 200 graduate students, and 1,450 undergraduate students. The online survey was sent out to the two departmental mailing lists and a week later a reminder message was sent out about the survey. The survey contained ten questions and details about the survey questions can be found in the appendix. The responses to the survey were recorded and analyzed by Survey Monkey. Because a free account of Survey Monkey was used, the number of questions was limited to ten. The face-to-face interviewees were chosen by the head librarian from active users of the two branch libraries. They were active users of the libraries who frequently inquired about the availability of print or electronic journals, and recommended book purchases. One non e-book user was also included into the interviewees. In total eight faculties and graduate students were interviewed. Two research scientists and two junior professors from the Chemistry Department were invited for interviews. From the Biology Department, one senior graduate student, one junior professor and two senior professors joined the interviews. All the professors who were interviewed conducted both research and teaching. Some of them were teaching undergraduate courses and some have taught both undergraduate and graduate levels courses. Respondents started 81 surveys and completed 78. Analysis of the survey results are discussed below. 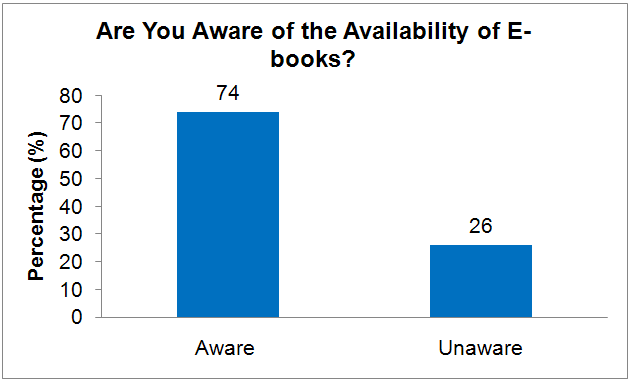 Seventy-four percent of the respondents stated that they were aware that a large number of e-books from Wiley, Elsevier, Ebrary, Springer are available to the IUB campus, while 26% were not (see Figure 1). It was interesting to notice that while the URL for a web page listing the most important e-books for chemistry and life science subjects and lists were sent out every month with new e-book titles, there were still quite a few graduate students, scientists, and faculty members who were not aware of the availability of e-books. The results of our survey contrasted with a survey conducted about e-book usage at the University of Denver (Levine-Clark 2006). It was reported that 59% of the respondents were aware of the library's e-books at the University of Denver. Among all their 2,000 respondents, 71% of the undergraduates, 56% of the graduate students, and 53% of the faculty answered yes to this e-book awareness question. Another survey on e-book usage in the University of Illinois stated that 55% of all the respondents were aware of the e-books offered by the library (Shelburne 2009). When breaking down into demographics, it was found that 61% of the undergraduates, 53% of the graduate students, and 60% of the faculty were aware of the e-books available. Both surveys found that undergraduate students were more aware of the e-books than graduate students and faculty because undergraduates have grown up in the technology and computer age. In the current research, the 74% e-book awareness percentage was higher than those reported in the literature for all the respondents, which were 59% and 55%, respectively. This higher e-book awareness percentage in IUB could be explained by the e-book web pages on both branch libraries' web sites and the e-book poster that has been made to publicize the e-book resources. However, considering the 26% unawareness percentage of IUB, the IUB libraries still need to market the e-books through collaboration with faculty members. Based on the survey responses, e-book web pages on IU libraries web site and library announcements sent to departmental mailing lists were the top two resources for finding e-books, which accounted for 54% and 43% of the total responses, respectively. The next two important resources to find e-books were searching based on a research topic on the publisher's web site and recommendations from colleagues (see Figure 2). 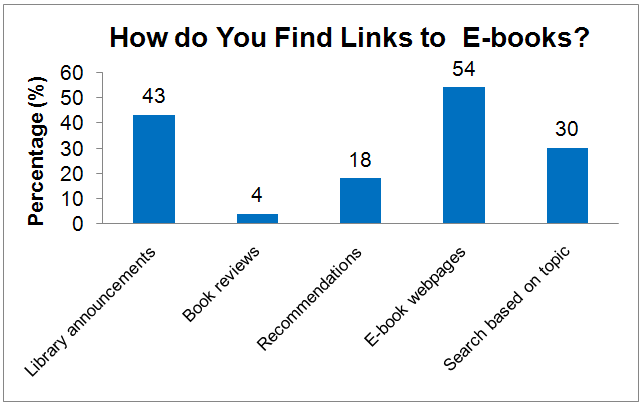 On one hand, the results indicated that the e-book marketing tools of the libraries -- web pages and library announcements -- did help publicize the e-book resources. On the other hand, e-book web pages listed only those e-books the librarian thought are most useful for either chemistry or life science. There were in fact more e-books that have not been listed on the page and thus possibly have not been explored and utilized to the extents that they should be. The survey responses indicated that there was still a long way to go to teach the scientists how to explore the e-book resources. Some other responses about how to find e-books included random searches on Google, calling the department librarian, or through IUCAT. It was also noticed that users encountered difficulties when searching for e-books under IUCAT. If they could not find the e-books they needed under IUCAT within several minutes, chances were that the users would switch to Google books for their searches. 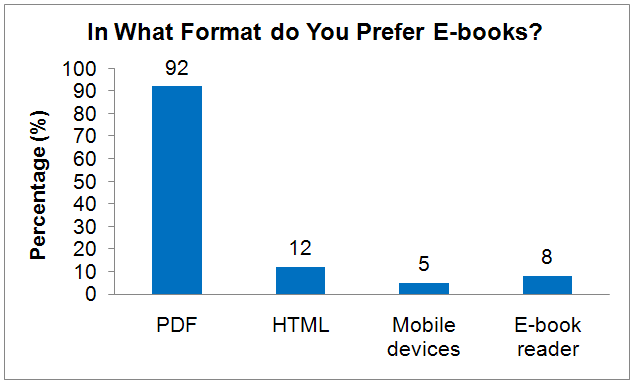 Participants of the survey were asked to indicate which book format was preferred: e-books or print. 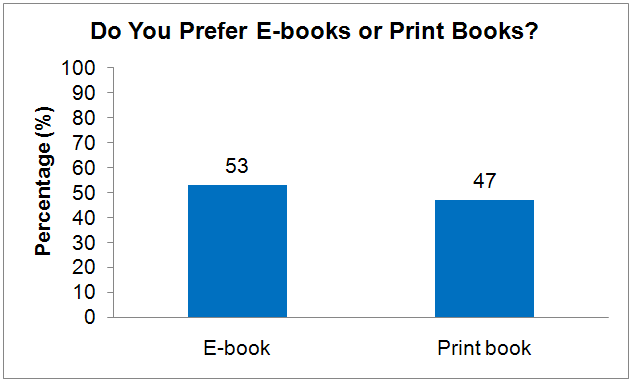 Fifty-three percent chose e-books while 47% chose prints (see Figure 3). These numbers indicated that e-books and print will coexist for a long time in the foreseeable future. "If I am really reading a book, I much prefer a print copy. If I need a book for general reference (e.g., a statistical, programming, or methods book, or one that is a compilation of individual papers), I prefer an electronic copy." "For historical perspectives/reviews, I prefer print. For faster-moving topics, I prefer e-books." "Print books are excellent for reference and are easier to read. E-books are great if they are download-able, allowing them to be printed for reference or used on a portable e-book reader." "More availability and I can print out chapters I need and only carry sections of the book with me instead of the whole thing." "(E-books) provide the most current information through links to podcasts, primary literature, videos, and other resources/references." The e-book usage in pure and applied science research carried on in the University of Oklahoma Libraries stated that 24/7 desktop access, multiple-users, and full-text search functionality were the top advantages of e-books (Bierman, Ortega & Rupp-Serrano 2010). The e-books survey conducted in the University of Illinois (Shelburne 2009) reported that advantages of e-books were described as "instant desktop (27%), ability to keyword search (25%), access from anywhere (17%), portability (15%), and environmentally better (7%)". It was obvious from the results of different researches that the 24/7 desktop availability was the top advantage of e-books. In order to promote the use of e-books, the libraries still need to work on the marketing of e-books and thus improve the accessibility of e-book resources to the users. When answering the question about what hinders them most in the use of e-books, 33% of the respondents indicated that e-books were difficult to read on a screen and 22% stated that e-books were difficult to find. 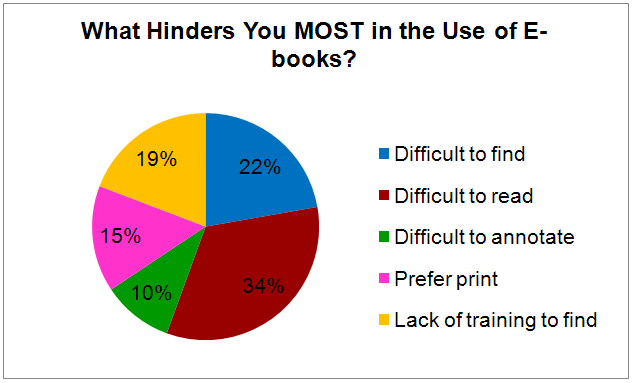 Other reasons included lacking of training to find e-books (19%), preferring print (15%), and difficult to annotate e-books (10%) (see Figure 5). Other factors that the participants stated hindered their e-books usage included difficulty in scrolling on the computer screen, lack of a portable e-book reader, and lack of awareness of e-books. Participants were also concerned about what e-books are being subscribed to by the university and thought an efficient "communication between the library and students/professors on a priority-based availability of e-books" was very important. It was also indicated that with a Kindle that could be carried with anywhere and read outside easily, respondents would be more likely to read e-books. Based on the e-books survey conducted in the University of Illinois (Shelburne 2009), the primary disadvantages of e-books were "difficulties to read from the screen (33%), navigation issues (10%), Digital Rights Management (DRM) (10%), and problems of locating and searching in general (8%)". Concerns about e-books from the teaching faculty of the University of Oklahoma (Bierman, Ortega & Rupp-Serrano 2010) included: desktop workstation was not good for in-depth reading; it was more difficult to evaluate the quality of e-books quickly; and the reliability of e-book content access. From the results of the current survey, it seems that design of a more user-friendly reading environment and more availability of books in e-book readers would promote the popularity of e-books. As far as the format of e-books was concerned, 92% of the respondents preferred PDF format, and 12% preferred HTML format (more than one answer was permitted). Eight percent of the participants preferred e-books on e-book readers and 5% preferred on mobile devices (see Figure 6). When asked the top three features influencing their opinions about e-books, the ability to print or save whole chapters (80%), search the full text (77%), and ease of use (52%) were the top three desirable features. The next three desirable e-book features were titles included in IUCAT (35%), note taking capability (27%), and sharing with colleagues (19%) (see Figure 7). The e-book survey conducted at the University of Oklahoma (Bierman, Ortega & Rupp-Serrano 2010) reported that the top three rated e-book features were searching full text, searching within content, and saving to the computer. It seems that the searching and saving functions of e-books were what the e-book users liked most. For the preferred e-book publishers or vendors, the top three e-book publishers were Wiley (40%), Springer (29%), and Elsevier (18%). Other choices were Royal Society of Chemistry (5%), Ebrary (5%) and Books 24/7 (3%) (see Figure 8). Reasons that the participants chose the specific publisher or vendor included types of books available such as reviews and reference books and topics covered for a certain subject, academic quality, and cost of the books. When asked what additional factors that they think publishers should consider when publishing e-books, some very helpful suggestions were provided. It was suggested that e-books could provide URL links to bibliographic programs and to articles cited in the book, and better searching functionality inside the e-books. Some participants wished they did not need to use interface of the e-book platform such as Ebrary and NetLibrary and could download the whole book as a PDF file instead of downloading it chapter by chapter. Some respondents were concerned about the movement of the library collection from permanent materials such as prints and materials through interlibrary loan (ILL) to a system where a rental fee is required to keep old collections. Some expressed worry about the academic quality and information timeliness of e-books. The digitalization of old books was also suggested. How Can the Libraries Promote the Use of E-Books? For the question about the most effective way that the library could promote the use of e-books, the survey participants provided some great ideas in addition to the current library web pages and announcements. It was suggested that the library could provide the service of e-book reader loaning, include more e-books into IUCAT, buy e-books with good academic quality, teach more about how to find, search for, and use e-books, make e-book links available within databases the same way as journal articles, publicize by specific subject interests, build a better e-book web page or database, get more e-textbooks, and improve the interface of IUCAT, such as displaying e-books and print titles separately when showing results, and adding a Frequently Asked Questions (FAQs) part. Some participants suggested that a short introduction to incoming undergraduate and graduate students on the available electronic resources would be very helpful. It was also mentioned that increased communication about e-book availability between libraries and professors was very important since professors could pass e-book URLs and other information to their students. Interviews with faculty, scientists and graduate students mainly focused on their personal experience with e-book usage, what features of e-books they liked most and had most concerns about, how they used e-books in their teaching and research, how the library could promote the awareness of e-books, and how the library could improve e-book service in general. Based on the face-to-face interviews, e-books have been used in both research and teaching. Junior faculty were more aware of e-books and tend to use them more in their teaching and research. More than one senior faculty member mentioned that they got to know the e-books available to the campus because of the current survey. E-books have been used in both undergraduate and graduate classes when the professor selected various chapters from several e-book titles as "textbooks." By doing this the students did not need to carry heavy textbooks and did not need to spend a lot of money on several textbooks. In addition, using e-textbooks was environmentally friendly. It was also mentioned by a faculty member that with an e-book, it was much easier to make class slides by copying from e-books and pasting the complicated compound structures into the slides. However, it also happened that a professor did not know a textbook he used for his undergraduate class was available as an e-book from Springer until his graduate teaching assistant told him about that. This unawareness brought the question about how to market the e-book resources and how to teach the professors and students to use the library web site. From the interviews, what the faculty and scientists desired most for research support was accessibility to the electronic resources. Many mentioned the difficulty they encountered when using IUCAT, IU's online catalog. It was mentioned that it was hard to tell e-books from print, or to tell IUB's resource from other IU campuses' resources on the search results page when eight IU campuses were sharing the same online catalog system. If an e-book could not be retrieved after several minutes from IUCAT, then it was very possible that the user would just give up finding e-books for the research topic of interest. A database that could incorporate all the available e-books to the campus and a web site with the front covers of e-books arranged by subjects were also desired. A professor mentioned that he listed important e-books for his research on his personal web site and added some brief subject words to each title in order to help the graduate students evaluate each title. Faculty members also emphasized the importance of teaching incoming undergraduate and graduate students about the e-resources of the library. They were also concerned about getting educated about e-books so that they could utilize the resources and in turn teach their students to use them. They also showed interest in mobile e-book reading device for reading during traveling since this was when they could find time to catch up on their reading. Based on the findings from survey and interviews, it seemed that e-books were getting acceptance among the users of the two branch libraries as electronic journals have. Seventy-four percent of the respondents stated that they were aware that a large number of e-books are available to the campus. The 24/7 desktop availability was the top advantage of e-book usage. Concerns about e-book usage included difficulty in finding e-books and difficulty in reading on a computer screen. Searching and saving features of e-books were what the e-book users desired most. The ability to save the whole book instead of single chapters was a feature that many users desired. Although faculty members and scientists welcomed e-books in both teaching and research, they felt that the lack of training in e-book finding and use hindered them from using and teaching their students about the resources. They hoped the libraries could build closer communication with faculty members and students to address their needs in e-book collections and to teach the skills for locating and using e-books. It was also noticed that students and professors used Google books to find books and e-books they needed. In this situation they probably did not realize that they could access to some e-books because the university subscribed to them. Concerns about how long the libraries could keep the electronic resources were also raised. A good example is the Dekker Encyclopedia of Nanoscience and Nanotechnology published by Taylor & Francis. When the IUB libraries stopped the subscription of this online encyclopedia, users could not get access to the contents of this encyclopedia at all. With more digitization of scientific research resources, such as the HathiTrust Digital Library, it can be predicted that science students and educators will rely more on online resources. This future trend poses the challenge for science librarians about how to reach the users of science libraries in the digital age. Some e-book features that the users desired could be considered by the publishers when publishing e-books. From the librarian's point of view, collaboration with the faculty members could help the libraries promote the e-book usage through education of users and outreach activities. 1. Are you aware that a large number of e-books from Wiley, Elsevier, Ebrary, Springer are available to the IUB campus? 2. If yes, how do you find links to e-books that you are interested in? Library announcements sent to departmental listservs. E-book webpages on IU libraries website. Search based on a research topic on the publisher's website. 3. Do you prefer e-books or print books? Are there situations where a print book is much more efficient and vice versa? 4. What is the MOST important reason that you use e-books? Available at your desk 24/7. Often multiple users can use an e-book (unlike print books). Availability on the e-book reader. 5. What hinders you MOST in the use of e-books? Difficult to read on screen. Lack of training to find e-books. 6. In what format do you prefer e-books? 7. What are the top three features influencing your opinion about e-books? Ability to print or save whole chapters. 8. Please choose your preferred e-book publishers or vendors below. What is the reason for you to choose that publisher or vendor? 9. Are there any additional factors that you think publishers should consider when publishing e-books? 10. What do you think is the most effective way that the library can promote the use of e-books? Armstrong C. and Lonsdale R. 2005. Challenges in managing e-books collections in UK academic libraries. Library Collections, Acquisitions, & Technical Services 29:33-50. Bierman J., Ortega, L., and Rupp-Serrano, K. 2010. E-book usage in pure and applied sciences. Science & Technology Libraries 29 (1): 69-91. Christianson M., and Aucoin M. 2005. Electronic or print books: which are used?. Library Collections, Acquisitions, & Technical Services 29:71-81. Dorner, J. 2003. The literature of the book @ e-books. Logos, 14(3), 144-149. Foote J. B. and Rupp-Serrano, K. 2010. Exploring e-book usage among faculty and graduate students in the geosciences: results of a small survey and focus group approach. Science & Technology Libraries 29(3): 216-234. Levine-Clark, M. 2006. 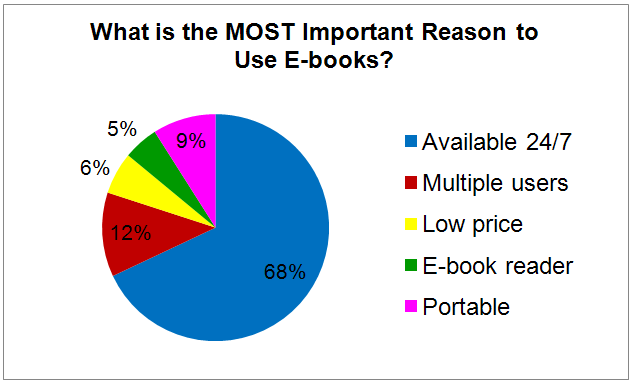 Electronic book usage: a survey at the University of Denver. Portal: Libraries and the Academy 6(3): 285-299. Shelburne W.A. 2009. E-book usage in an academic library: user attitudes and behaviors. Library Collections, Acquisitions, & Technical Services 33:59-72. Sprague N. and Hunter B. 2009. Accessing e-books: taking a closer look at e-book statistics. Library Collections, Acquisitions, & Technical Services 32:150-157.